During World War 2, a squadron of British soldiers are ordered to surrender to the Japanese, and are taken to a prisoner-of-war camp in Thailand. 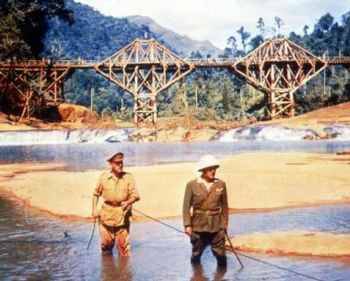 There, they are instructed to assist in the building of a bridge (over the river Kwai), and every soldier must help, regardless of rank. The Geneva convention clearly states that officers are exempt from such duties, s when they are forced to work alongside the rest of the men, the officers are thrown into containment. Meanwhile, a small group of men outside of the camp are planning to make their way through the jungle to destroy the bridge. It would be something of an understatement to say that I was looking forward to seeing this film for the first time. I’m a big fan of classic war movies, particularly those made in the 1950s and 60s such as The Great Escape and The Dirty Dozen. Also, Bridge was on the receiving end of a great deal of critical acclaim, including seven Oscars from eight nominations, including Best Picture, Actor, Director and Adapted Sceenplay. It also stars Alec Guinness, who is great in everything, particularly Kind Hearts and Coronets (oh alright, and in Star Wars), and it’s primarily about the building of a bridge, which appeals to the engineer in me. Also, this film fulfills a criteria that’s very rare amongst cinema – at least three other members of my immediate family like it – my father and his parents, from whom I borrowed the DVD for this film. It therefore gives me great pleasure to announce that this is one of the best films I’ve encountered so far on my journey through the List. I’ll start with Alec Guinness. He’s brilliant. Not just in general, but here, in this film. Just amazing. His character, Colonel Nicholson, has the largest arc character-wise in the film, yet remains completely civilised and with the stiffest of upper lips, regardless of his situation. Bearing in mind that this involves being locked inside a corrugated iron box in the baking sun with no food and water, the fact that his character still remains believable in the face of such adversity is a testament to Guinness’ acting ability. His foe in the camp is the largely incompetent Colonel Saito (Sessue Hayakawa), a man who detests the English for their lack of pride, shame or courage, even though he completely fails to see it in everything Nicholson does. 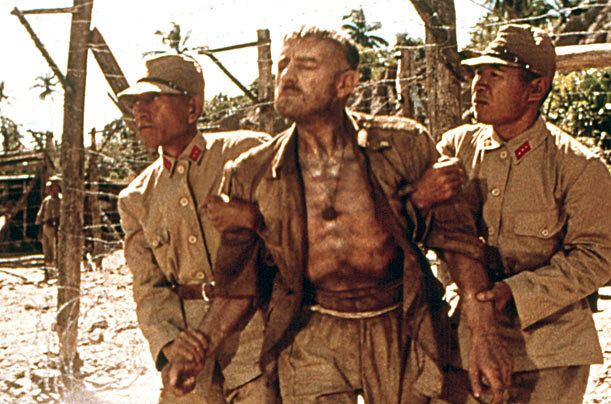 What is it but pride that drives the starving, weary, broken Nicholson to shrug away the offers of assistance to walk from the Oven to Saito’s hut in front of the ranks of his soldiers? The scene following this grand display is another example of some great acting and dialogue within a film full of them, as Saito offers Nicholson the opportunity to be released if he agrees to work on the bridge. Initially, Saito is fully aware that he is in a position of power and commands the conversation, yet it is not long before everything is under Nicholson’s control. I was so impressed with Guinness’ powerful central performance that I was a little miffed he was given second billing to William Holden as Shears, the only American prisoner in the camp, who manages to escape and ends up assisting a small squadron of soldiers returning to the bridge to blow it up. Although I’m aware the story is mostly fictional, I felt the character of Shears was written in to provide an easily accessible American within the cast, to more readily appeal to a wider audience. This is understandable, and I’ll even forgive The Great Escape for doing something similar, but giving him top billing over Guinness is unforgivable, especially seeing as Holden doesn’t do a great deal of heavy lifting in the film, as far as I could see. His character is more likeable, certainly, but that’s because he’s more of an everyman, and I suppose technically the hero of the film, but I’m positive Guinness has more screen time. This may have had something to do with the apparently tumultuous relationship Guinness and director David Lean had on set, with the latter apparently being very glad when he got the chance to finish the British scenes and begin working with an American. The locations on display here are breathtaking, particularly a wide, distant shot of the bridge near the end of the film, which is worthy of being framed and hung on the wall. The production design is also impressive, particularly the climax. It’s evident they actually built a bridge just for the film, probably several, and this really benefits the film’s authenticity and sense of scale. The incredibly tense finale – made ever more so with the sounds of a steadily approaching train – were undeniably effective, in spite of my having a fair idea of what was due to happen. Truly, this is one of the great films, showing that war is crazy and can drive you as such. There are moments of comedy, admittedly few, but they’re there, astounding effects, top-notch acting, and I defy anyone to watch this film without whistling along. 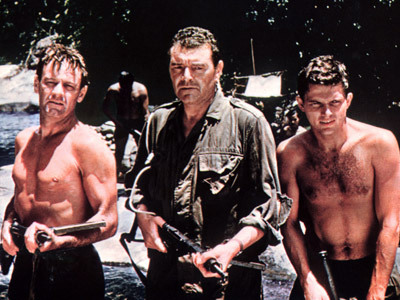 This entry was posted in 09/10, 1001, 5-Star 500, Choose Film, Empire Top 301, Empire Top 500, Review, The List and tagged Alec Guinness, Ann Sears, David Lean, Geoffrey Horne, Jack Hawkins, James Donald, Sessue Hayakawa, The Bridge on the River Kwai, William Holden by jaycluitt. Bookmark the permalink. This is such a great film. Like most people in my generation, Alec Guinness started and stopped with his role in Star Wars. When I saw this, it was an incredible revelation that this man had serious acting chops. It’s my favorite of his performances (yes, I know…bad Star Wars geek), particularly because of the last few minutes. I think most people discover Alec Guinness through Ben Kenobi, regardless of generation, I know I did. He is what made this film for me. I think I’d still have liked it if he’d been replaced with a lesser actor, but with him in it I LOVED this. Glad to hear I’ve inspired you to re-watch the film! I didn’t know that was where I knew the whistling tune from, so it was a nice little surprise for me. I actually show part of this movie in my Advanced Chemistry course every year. I play the opening where Guinness’ soldiers march into the camp whistling “Colonel Bogey.” I then tell them that I would love it, on the day they sit for their huge national Advanced Placement Chemistry test, if they walk into the testing facility as a group whistling this song. As yet, no class has actually whistled it on the day of the test, but it has become the unofficial theme song of my Advanced Chem class throughout the years. 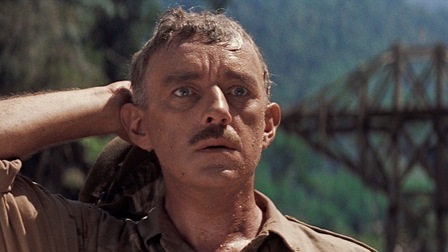 Although I hardly consider my students POWs, they are in an incredibly challenging course, one that asks a lot of them, and I see the song, and its use in Bridge on the River Kwai, as a rallying point for them, something they all share, something that binds them together, working for a common goal. Because crap, this is a great movie. I’m sure if your students weren’t quite so concerned with the impending test they’d be more than willing to do the Bogey march. You could try and get them to do it for a fire drill or an assembly instead!